The Mission of the Traffic Safety Program is to reduce the number of motor vehicle crashes that cause personal injury, death, and property damage. We hope to accomplish this mission through voluntary compliance, education, and enforcement of the state traffic laws and the local traffic bylaws. It is the responsibility of all the officers assigned to the Operations Division (patrol) to enforce the traffic laws and to educate the public about the traffic laws. They achieve this while on regular patrol, responding to citizen complaints, and via patrols directed by motor vehicle crash data. If you wish to report a traffic-related problem please telephone the police department at 774-255-4527. Normally a patrol officer assigned to the sector in which the problem is occurring will handle the problem. More complicated traffic problems will be directed to the supervisor of the Traffic Safety Program. We clearly understand that a safe and efficient road system is a quality of life issue among the residents and visitors of our town. Any input that will help accomplish our mission is welcomed and appreciated. Motor Vehicle Crashes and the Three E’s: Engineering, Education, & Enforcement. On a regular basis the Town and State review the number of crashes at certain locations to determine if the road needs safety improvements (road construction, traffic lights, signs, etc.). Information is also disseminated by the Falmouth Police Department and the Massachusetts Registry of Motor Vehicles (RMV) about the rules of the road with the goal that drivers will voluntarily obey the rules. If needed, traffic rules are enforced by the police via the use of citations. 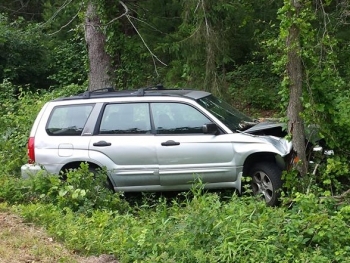 A “crash” is an avoidable motor vehicle collision. The word accident implies an occurrence completely beyond someone’s control. A crash is caused by factors such as excessive speed or impaired driving that almost always can be controlled by drivers. Each patrol vehicle assigned to a beat is normally equipped with a Kustom Signals Pro-1000DS Traffic Safety Radar System. The unit has two antennas; one is located in the front and the other is located in the rear of the patrol vehicle. Speed-readings can be obtained while the patrol vehicle is moving or stationary. 16,503 murders in the United States vs.42,643 fatal motor vehicle crash deaths in the United States. 142 murders in Massachusetts vs. 462 fatal motor vehicle crash deaths in Massachusetts. How can I receive traffic enforcement on my street? Please call the police department at 774-255-4527 and give the communications personnel a detailed description of the traffic-related problem. Normally a police officer assigned to the sector in which the problem is occurring will handle the problem. Complicated traffic problems will be forwarded directly to the Traffic Safety Officer (Officer James Porter, 774-255-4527 ext. 4651, email). Can a citation be issued to a violator if I am the only witness? Yes, a police officer can issue a citation whether or not the offense occurred within his/her presence. However, the witness may be required testify before the court about the incident. Can the police conduct traffic enforcement on private streets? For the most part, traffic laws & regulations may not be enforced on private streets. There are a few exceptions; however, they are limited to criminal traffic offenses. Civil infractions (e.g., speeding) cannot be enforced on private streets. What is the “speed trailer” and how can I request the “speed trailer” be set-up on my street? 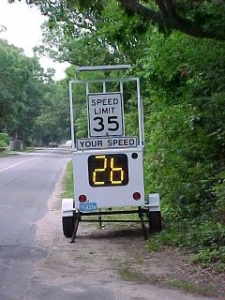 The “speed trailer” is a piece of equipment the police department uses to education the public about the speed limit on a particular street in relation to the speed their motor vehicle is traveling. It is first set-up on the side of the road. 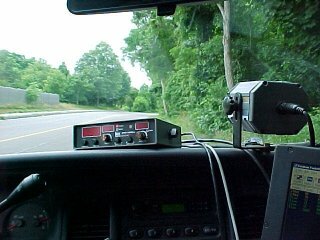 While vehicles approach the “speed trailer” a traffic radar unit determines its speed and displays it on a large LED screen. If you believe speeding is a problem on your street please call the police department at 774-255-4527 and give the communications personnel a detailed description of the speeding problem. If available, a police officer may be sent to your home to take the complaint. Next, request that your street be added to the “speed trailer” list. How can I have a traffic-related sign “replaced” on my street? Please call the Department of Public Works Highways and Parks Division at 508-457-2543. Note: If your street has not yet been accepted by Town Meeting (i.e., private) the replacement of any signs on the street will not be authorized. How can I have a “new” traffic-related sign erected on my street (public)? Note (speed limit sign): If you wish to request a “speed limit” sign please refer to the special speed regulation (speed zone) questions. How can I have a “new” traffic-related sign erected on my street (private)? If your street has not yet been accepted by Town Meeting (i.e., private), new signs on the street will not be paid for by the town. If in agreement, the residents of a private street may erect traffic-related signs. How can a “special speed regulation” (speed zone) be established? Important Note: Unless a minimum of 100 vehicles per hour travels the street during off peak hours, under ideal weather conditions, a special speed regulation (speed zone) will not be authorized. Click here to review the Procedures for Speed Zoning on State and Municipal Roadways. If my street does not qualify for a special speed regulation (speed zone) what can be done to make the street safe from speeding vehicles? When available, police patrols can conduct traffic enforcement using the “basic speed law” (or the “fundamental speed law”). Please call the police department at 774-255-4527 and give the communications personnel a detailed description of the speeding problem. Normally a patrol officer assigned to the sector in which the problem is occurring will handle the problem. More complicated traffic problems will be directed to the Traffic Safety Officer (Officer James Porter, 774-255-4527 ext. 4651, email). What is the “basic speed law” (or “fundamental speed law”)? This includes traffic conditions, pedestrian conditions, road conditions, and weather conditions. EXAMPLE: If you were driving 55 mph during a snowstorm on a highway with a posted speed limit of 55 mph, you could still be issued a citation for driving too fast for the current conditions. · Over 20 mph in a school zone. · Over 30 mph in a thickly settled or business district. · Over 40 mph outside a thickly settled or business district. · Over 50 mph on a highway outside a thickly settled or business district. Can speed bumps be installed on my street? If in agreement, the residents of a private street may purchase and install temporary style speed bumps. The speed bumps must be removed from the street during the winter months so that snow can be cleared from the street. “Speed bumps” are not authorized on public streets in the Town of Falmouth. However, the residents of a public street may request that a “speed table” be installed. It should be noted that speed tables are for special circumstances only. At the present time only speed table has been installed in the Town of Falmouth and it does not appear any more will be approved. How can I tell if a vehicle is traveling above the speed limit? Large vehicles such as dump trucks, trash trucks, and tractor-trailer rigs sometimes appear to be traveling faster then they may seem. Loud vehicles such as trucks, motorcycles, and some sports cars sometimes appear to be traveling faster then they may seem. Vehicles negotiating corners sometimes appear to be traveling faster then they may seem. Vehicles traveling on a narrow road sometimes appear to be traveling faster then they may seem. Keeping these principles in mind, you should observe the traffic flow on your street. Traffic studies indicate that 85% of the public will travel at a reasonable and prudent speed. As you observe the traffic, it will usually be evident what the appropriate speed is for your street by judging the majority of the traffic. You may also enlist a family member, friend, or neighbor to travel the road at the speed limit while you observe. This is a great method for you to learn what a particular speed looks like with a trusted party operating the vehicle. How can I an obstruction be removed? 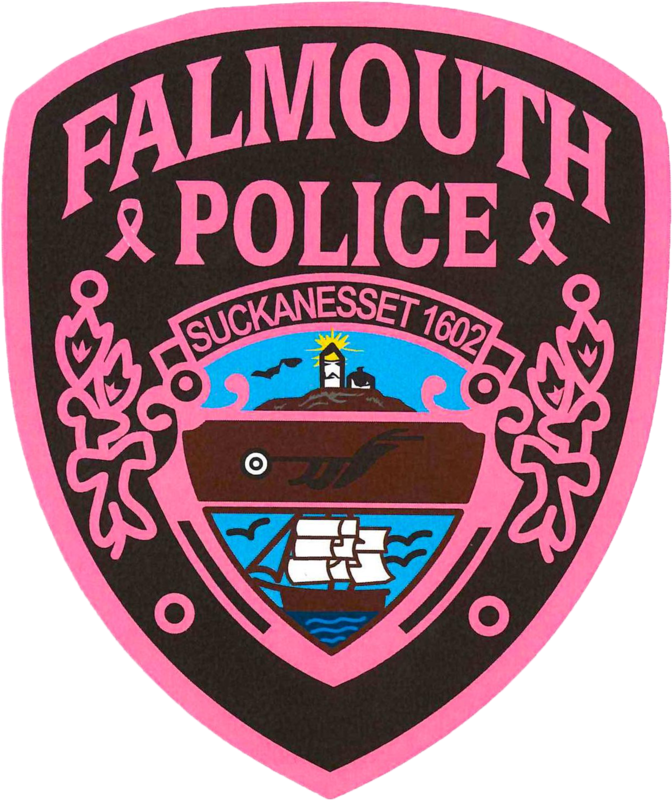 The mission of the Falmouth Police Department is to provide ethical, crime prevention and detection. This is accomplished through professional service in partnership with the community: to improve quality of life by meeting the ever changing and growing needs of our diverse community and its visitors. Thank you for these updates. They can be very useful when you are trying to get around town. There are alternative routes. Wow.. Thanks for the important info..